I'm not a dirty hippie or anything, but I do like organic foods. I even like organic beer. Like this one here. 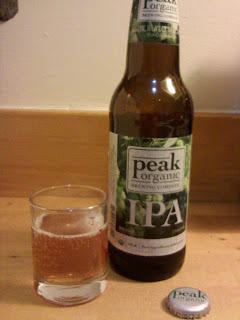 Peak Organic Brewing Company is a small craft brewery located in Portland, ME. No, not the one in Oregon. This Portland is in Maine, which is basically Canada. Starting back in the 90s, POBC wanted to make beer from sustainable goods, so they started shopping around at local farmers markets and used organic produce in his beers. I wonder if they made a zucchini flavored beer? Yuk. Well, the owners decided that beer actually tasted better if they used better products to make it (no duh), so they said fudge it, and went on using only tasty local organic goods in their beers. I like the idea of buying local goods, but what if this was your hometown? I don't think they had high quality local goods there. POBC makes a total of THIRTEEN brews, including one that tastes like espresso. So maybe I'm not far off with the zucchini beer. The IPA from POBC is quite yummy, which goes to show you can do without the preservatives and have a great tasting brew. The IPA has a rich color and aroma, and tastes all around delicious with its hoppy-attitude. Even with the high hop content (76 IBUs), it goes down smooth and its easy to drink a few. I only had one, and that was enough to get me a bit tipsy, especially with its superhero-esque 7.2% ABV. I had this with a chicken enchilada, and that was a bad idea, as this IPA (and probably all of them) don't go with Mexican food. So what if I was out of Tecate, I needed a drink! At $9-10 a six-pack, its pretty standardly priced, and you'll be able to find it at your local Whole Foods or co-operative grocery store. Or anywhere else dirty hippies can be found. UPDATE: 7/29/11 - I just had this beer again and totally need to redo my ratings. Maybe I'm coming off of a run of below-average beers, but this time around the Peak IPA was almost too good to be true. The taste is so rich and refreshing its unbelievable, probably the best IPA I've had outside of the Pacific NW. I had it this time while in Maine (it is brewed in Portland, ME) so maybe by being in the same state it was better, I dunno. I do know that a variety 12 pack of the Peak brews only cost $12.99, which is AWESOME. This beer is great and it gets a bump in each category, especially the value and taste.